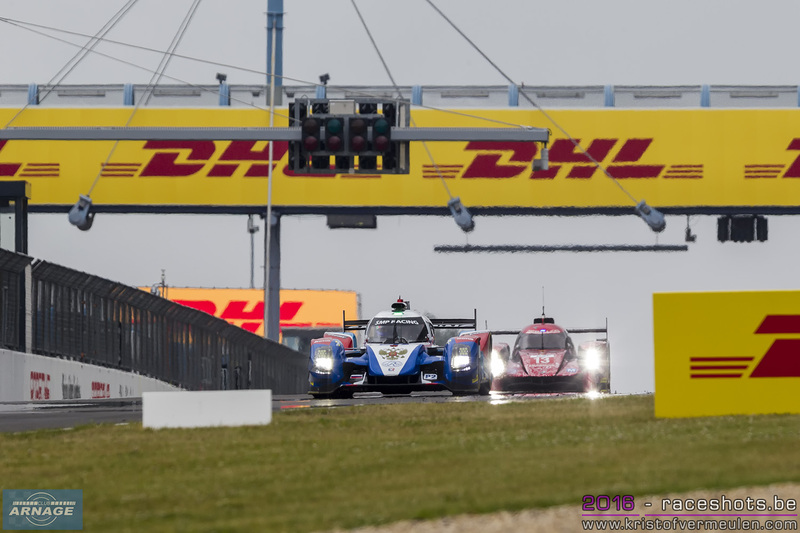 Jaime Alguersuari, President of RPM Racing and Gérard Neveu, CEO of the FIA World Endurance Championship (WEC), and, have reached an extremely encouraging agreement that will link the Formula V8 3.5 series to the majority of the 2017 WEC events. 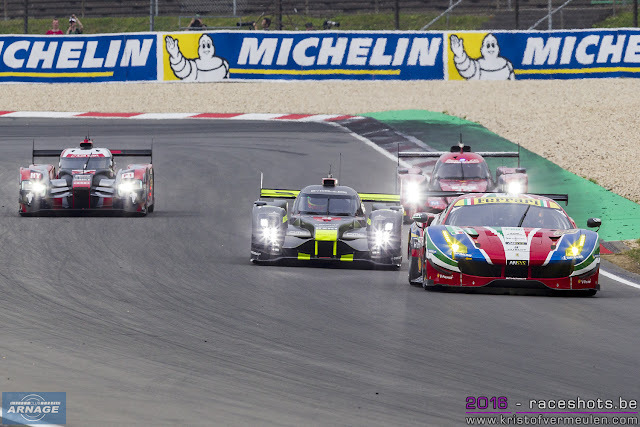 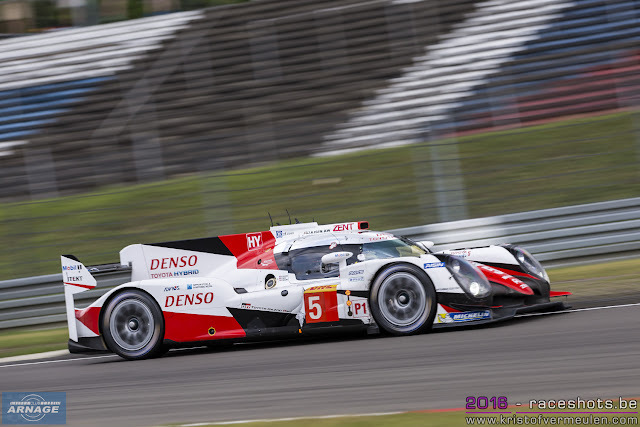 The agreement includes a minimum of three overseas rounds in Mexico, Japan and Bahrain, the last being the final event of the endurance championship, in addition to three of the four European events on the WEC calendar: Silverstone, Spa and Nürburgring. 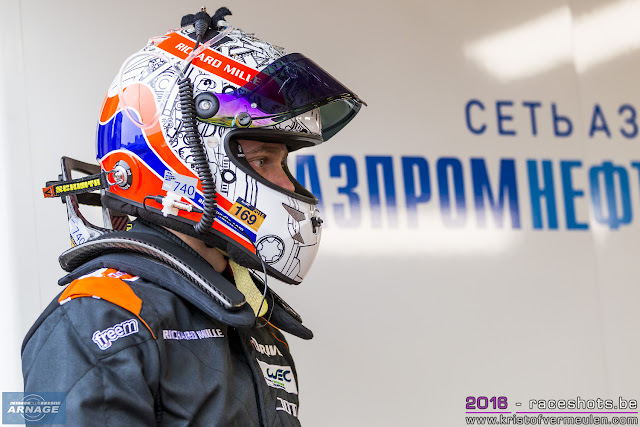 Both organizations have as their main aim the desire to provide young single-seater drivers with the opportunity to enter a professional motorsport environment offering a clear and well-defined professional career path including LMP1, LMP2 and GTE in addition to any other series in the pinnacle of motorsport. 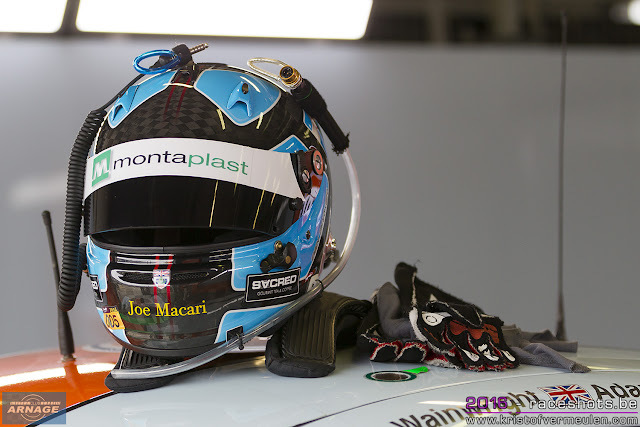 This benefits not only the drivers but also their families or backers. 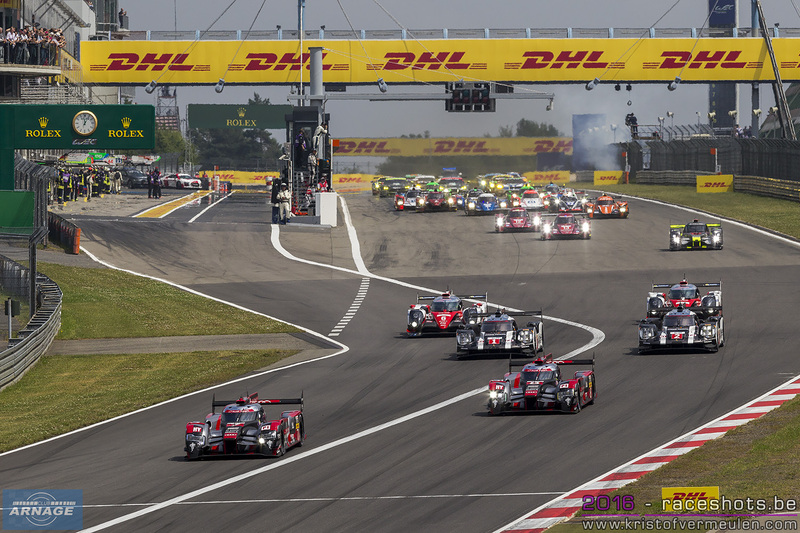 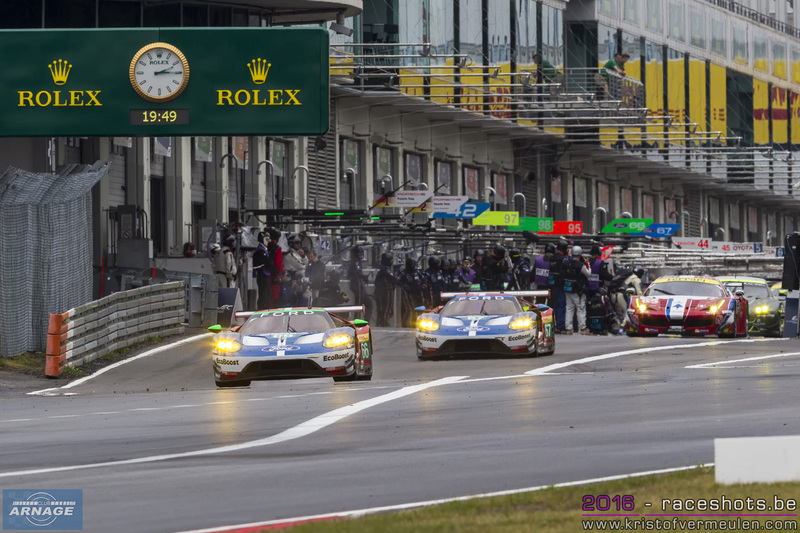 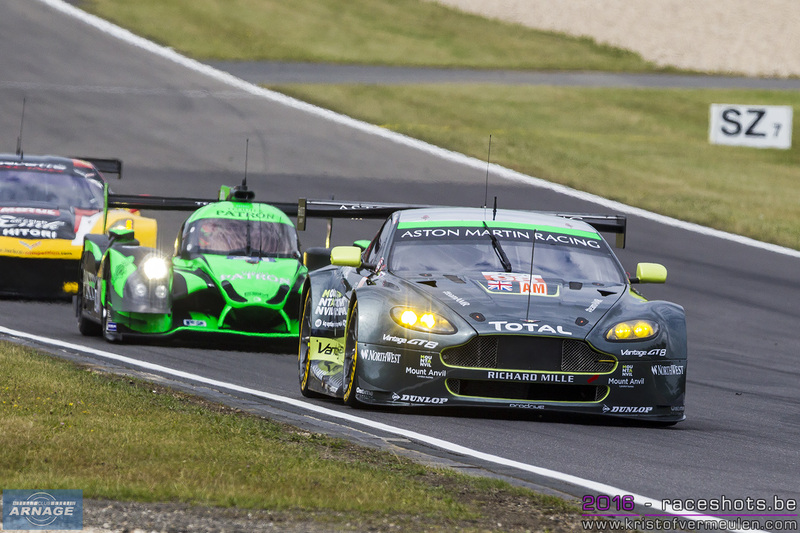 The WEC and RPM wish to offer the young drivers an outstanding international calendar with affordable costs. 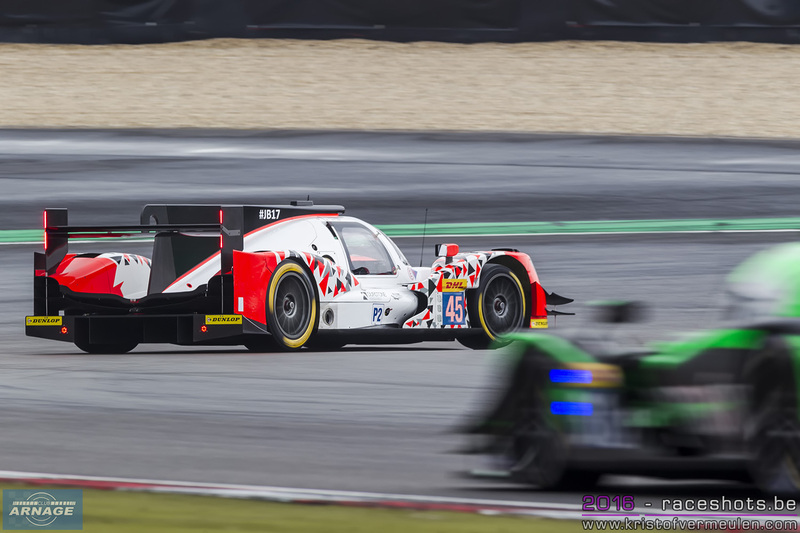 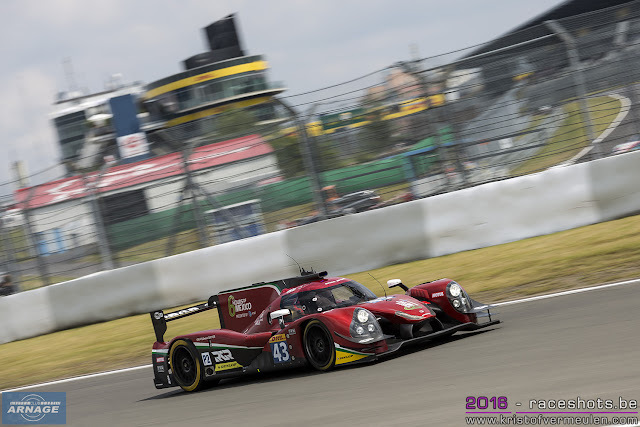 Included in this historic new motorsport project is an amazing prize: the chance to be part of the WEC’s Rookie Test in Bahrain in the main categories of LMP1 or LMP2 or GTE for the drivers placed first, second and third in the Formula V8 3.5 championship. 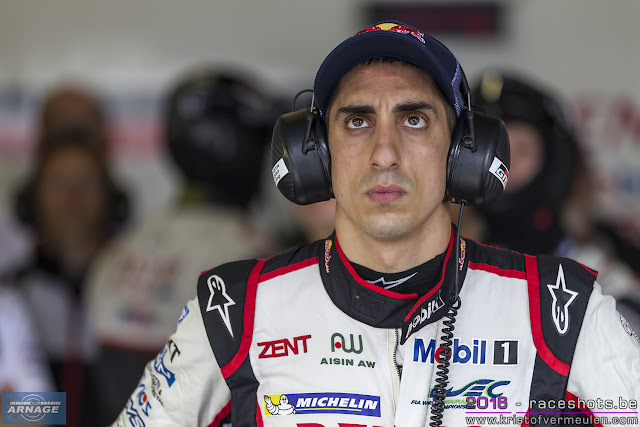 Jaime Alguersuari, RPM President: “In 1998, exactly 18 years ago, RPM created a championship to help young talented drivers and their families to have a better understanding of a career in professional motor racing. 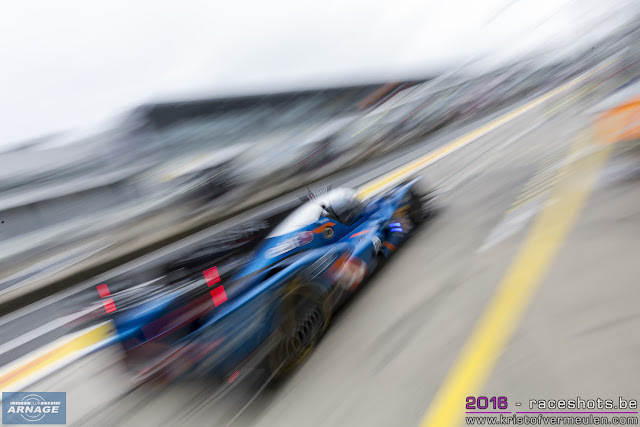 That championship, originally called Formula Nissan, was won in 1999 by an 18-year-old driver whose name was Fernando Alonso. 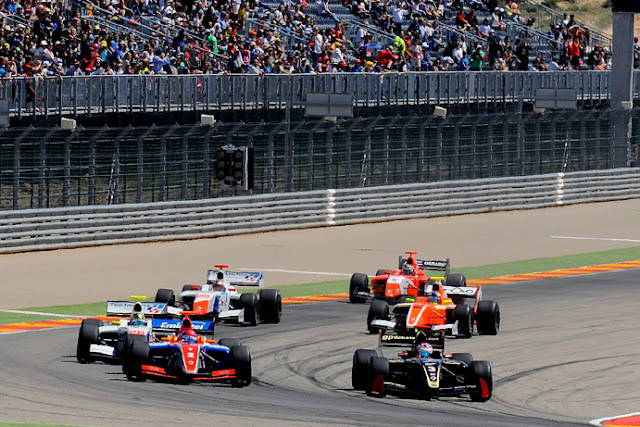 In 2005, with a new single-seater powered by 3L V6 engines, we signed an agreement with Renault Sport Technologies which was in force until 2015. “Since 1998 this championship has been the path to reach Formula 1 for 25 drivers. 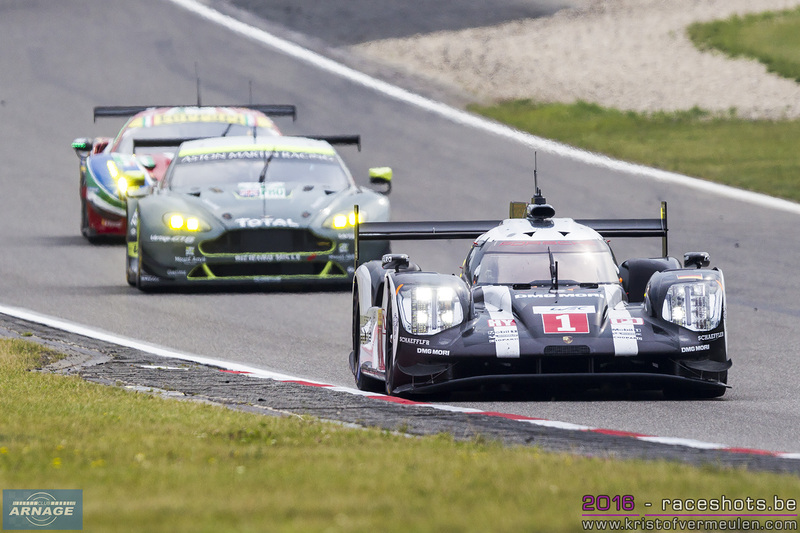 Today, I am pleased to announce that this agreement with the FIA World Endurance Championship is the most exciting project of my professional career. 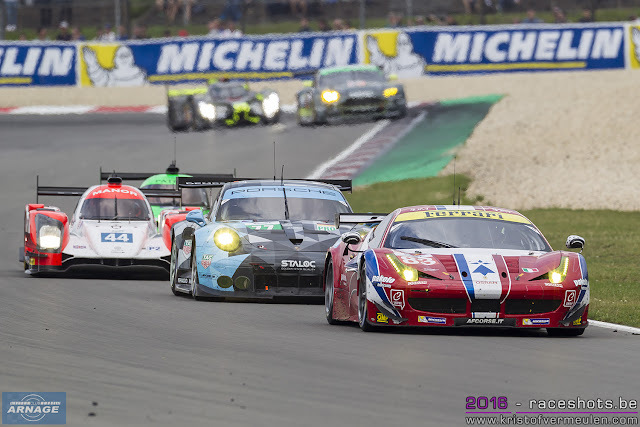 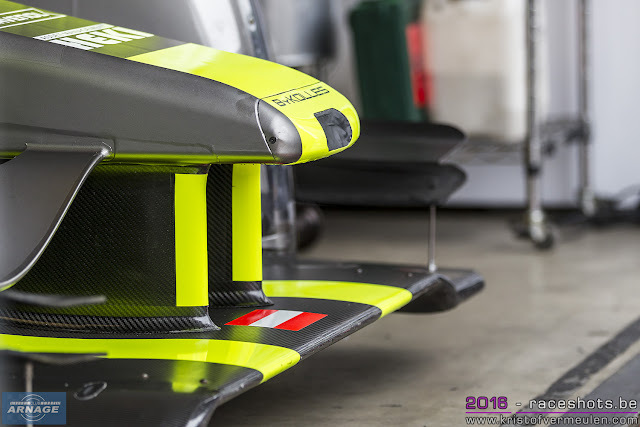 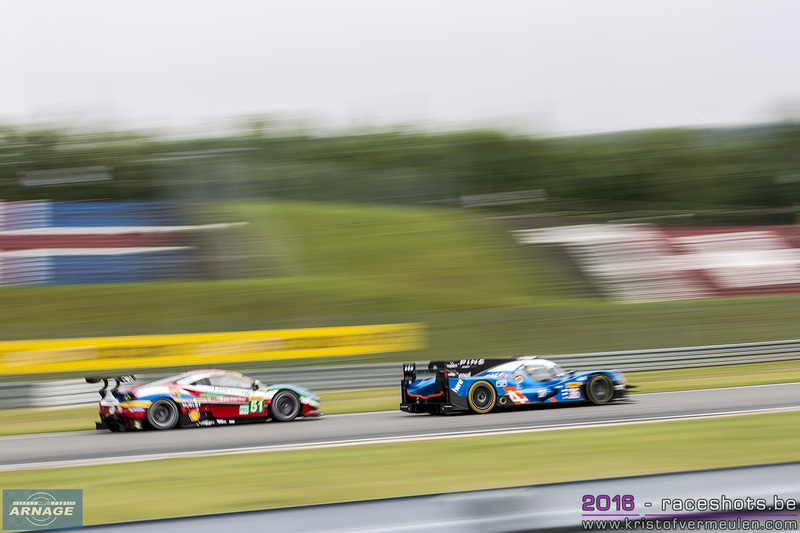 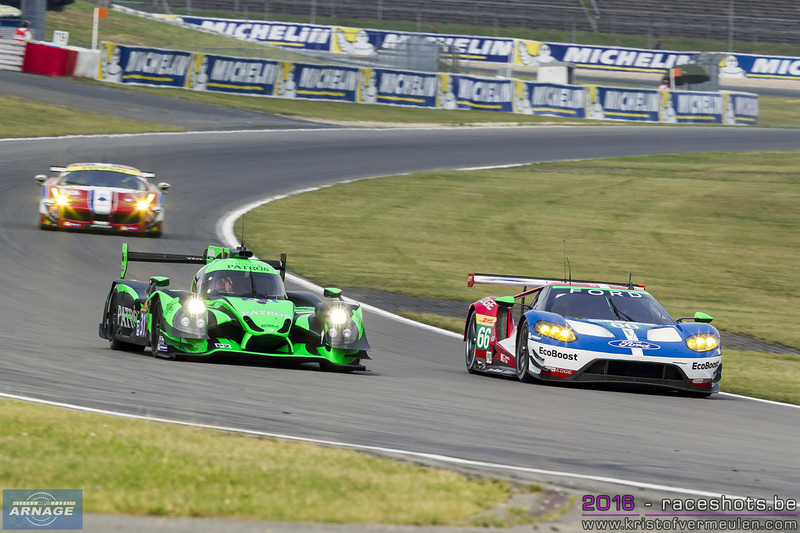 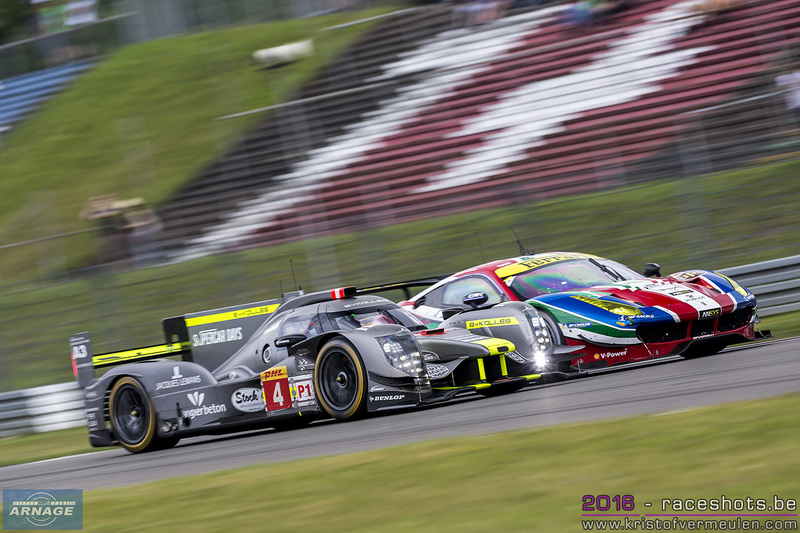 The new series, linked to the FIA WEC, is a historic challenge because a single-seater championship of this level has never before offered such a wide international calendar at an affordable budget." “Racing in the same major events where official Manufacturer teams from renowned automotive brands such as Toyota, Audi, Porsche as well as Ferrari, Aston Martin, Ford and Corvette are competing in the world’s leading endurance championship, will allow our talented drivers to show off their skills in front of a prestigious and knowledgeable audience. 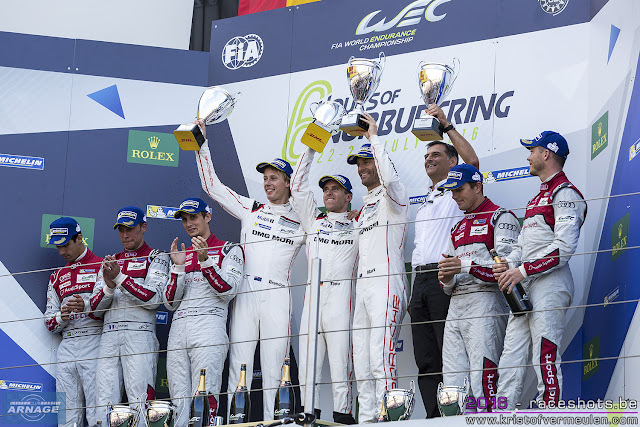 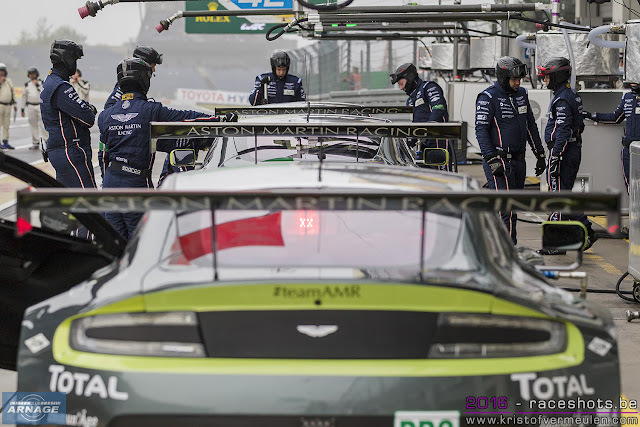 Therefore, making an effort to reach the agreement between the FIA WEC and RPM was definitely worth it”. Gérard Neveu, FIA WEC CEO: “It is very good news that the V8 3.5 series will join the FIA WEC race meetings from 2017. 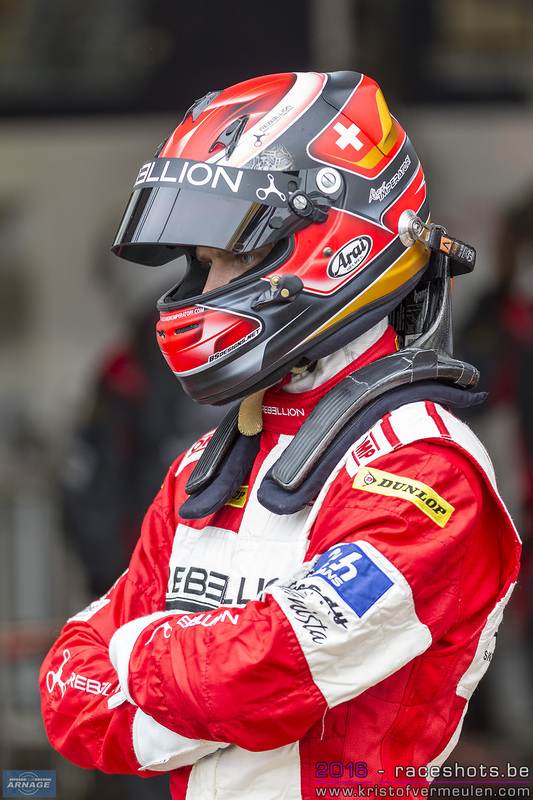 Great news for the fans, but also for the young drivers who are the champions of the future, and the future is tomorrow. “This single-seater championship has demonstrated for many years how very appealing and exciting it can be, while at the same time providing many great champions. It makes sense to offer to the new generation of drivers access to a well-established championship such as the FIA WEC. 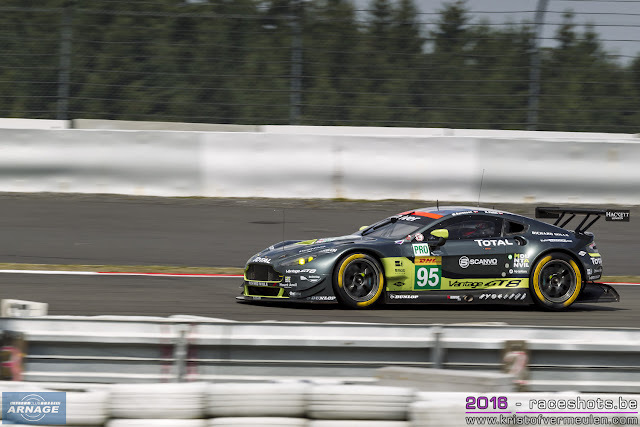 The fact that the champions will have an opportunity to take part in the WEC’s official rookie test at the end of the season will be additional motivation and a target for everyone on the grid. “We know also that RPM, promoter of this single seater championship, shares the same values as the ACO, the promoter of the FIA WEC. 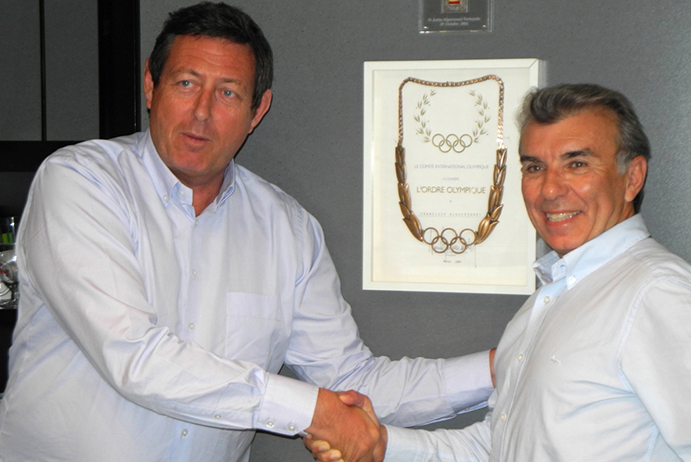 It was logical to join together. 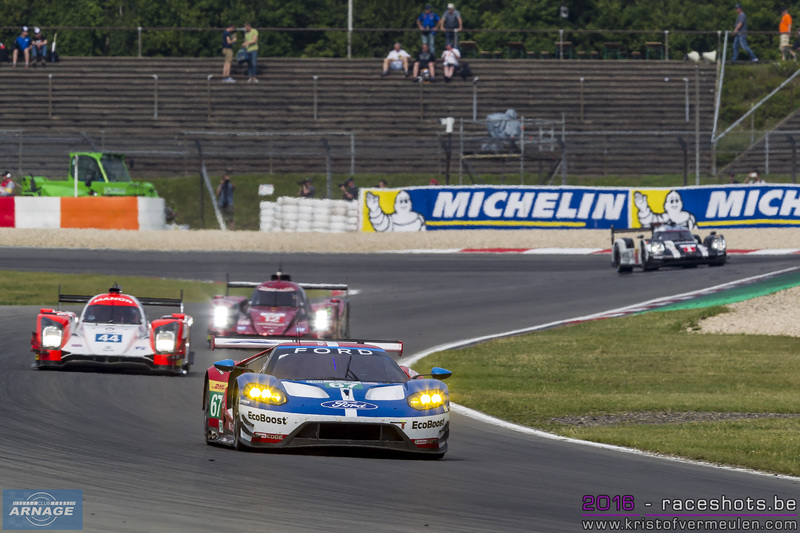 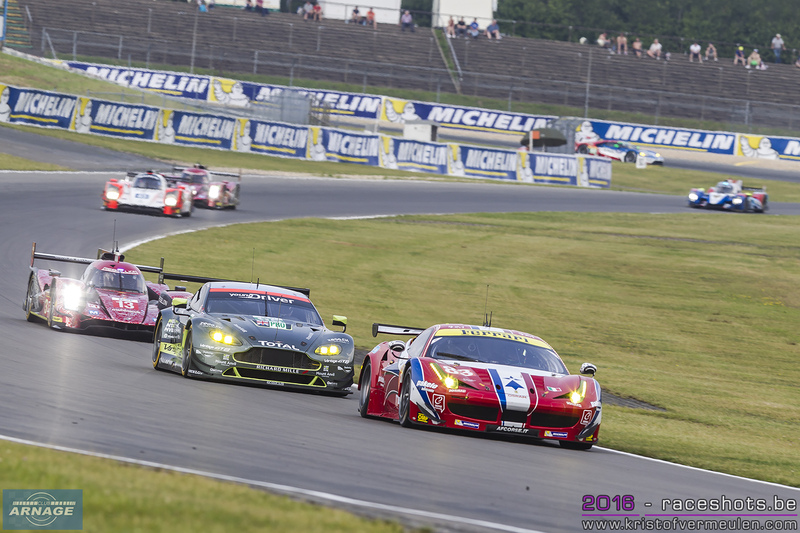 This combination of V8 3.5 and Sports Prototype and GT cars, in the same place at the same time, will provide for the pleasure of the fans a fantastic motorsport show with great racing over the same weekend, a real festival of motorsport. More info about the Formula V8 3.5 can be found on the website of the series. Under warm sunshine, all cars got safely around the first lap after the race start at 13:00 CET. 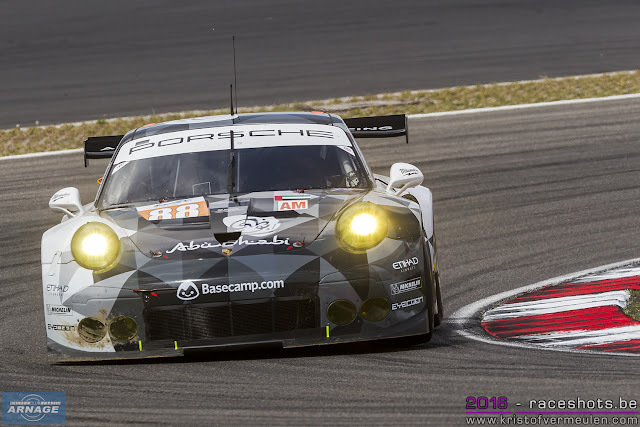 Bernhard in Porsche #1 slipped into 2nd between the two Audis. 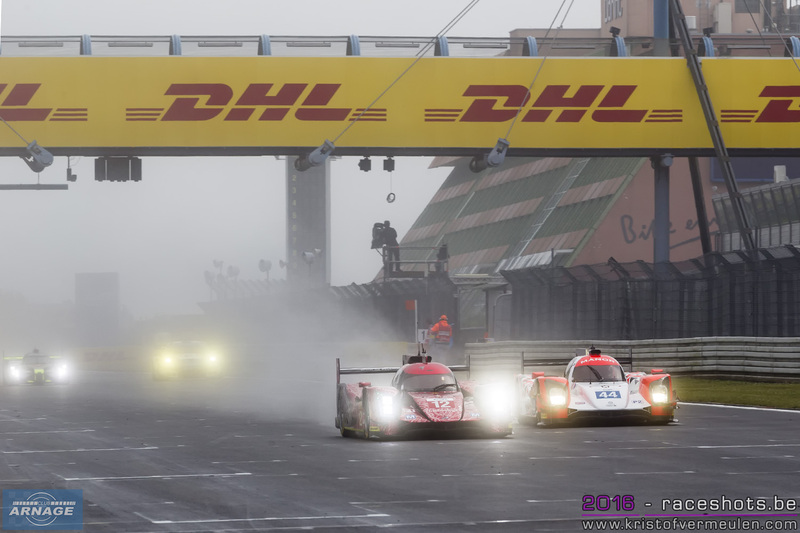 At the 30 minute mark, the leading LMP1 cars were in the same order but passing the LMP1 privateers. On lap 20 Bernhard #1 passed #7 Fassler into T1 but ran wide and was immediately re-passed. Jani in #2 Porsche had a brake lock-up at T1 and touched Mucke in #66 Ford GT. Mucke managed to keep position ahead of Bruni in #51 Ferrari. 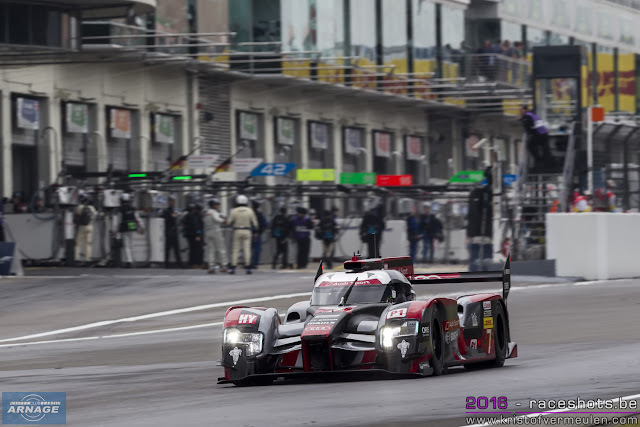 The first round of pit stops allowed Hartley in Porsche #1 into the overall lead and Kane in Strakka #42 into the lead of LMP2, but he was soon re-passed by Brundle in #26 G-Drive Oreca. 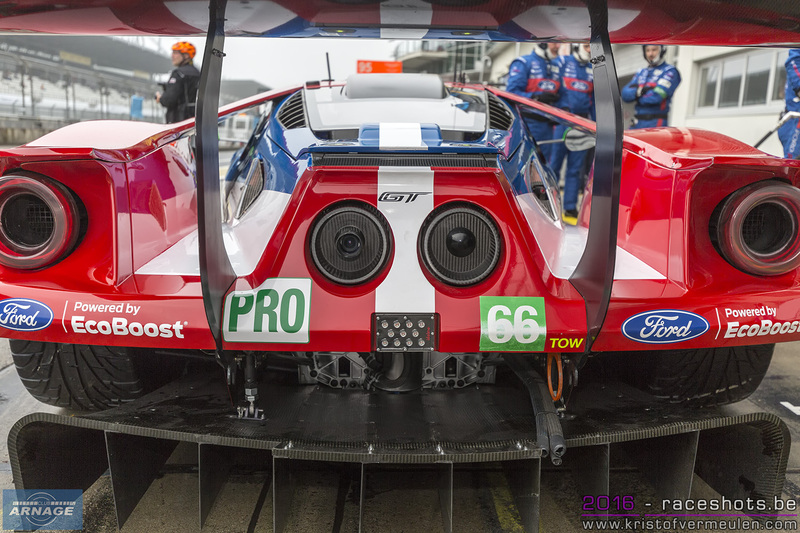 At 14:04 there was a fire outside the #67 Ford GT pit during refuelling. 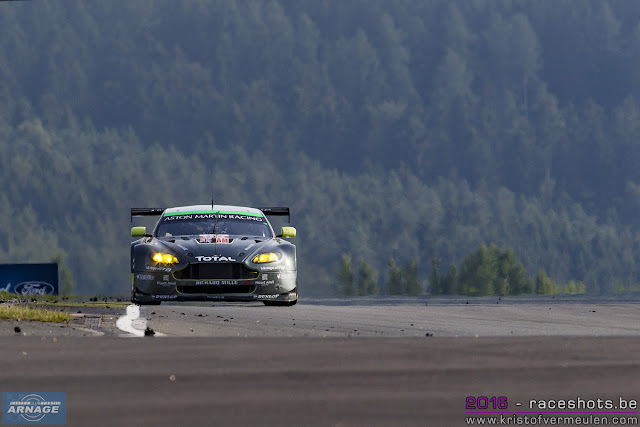 Andy Priaulx safely out of car and the fire was promptly extinguished. The Ford GT spent 23 minutes in the pit box before rejoining with Priaulx at the wheel. 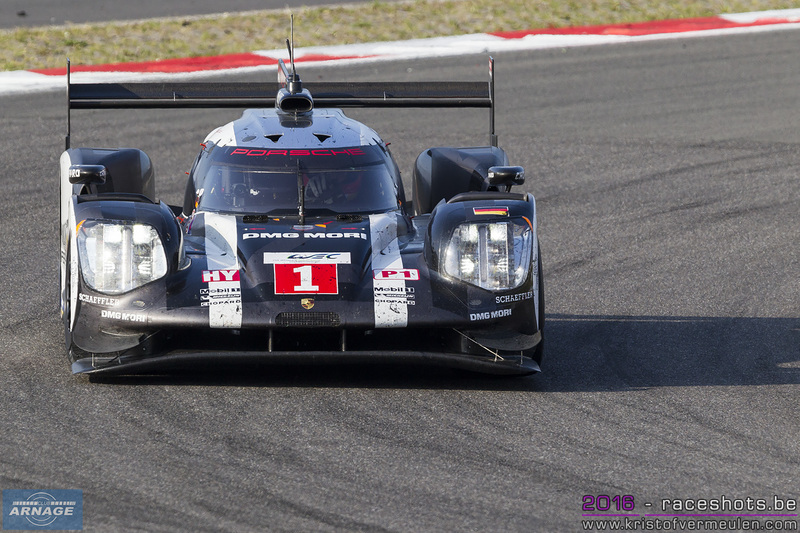 Hartley seemed to have problems, then made an early stop in #1 Porsche with a suspected puncture and handed over to Webber who rejoined in 6th. 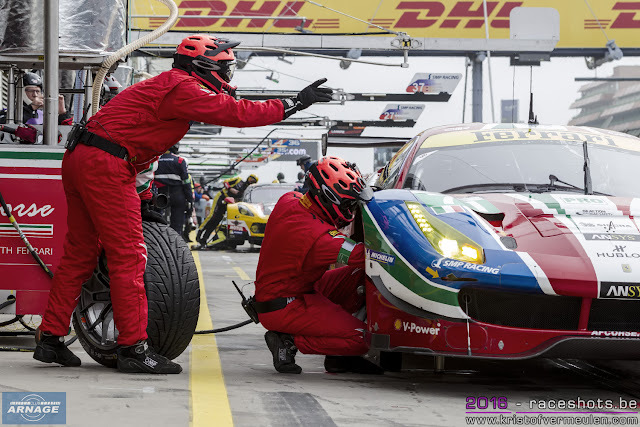 The first full course yellow of the race was at 14:58 as Ferrari #83 (Perrodo) was pulled from gravel at the chicane. 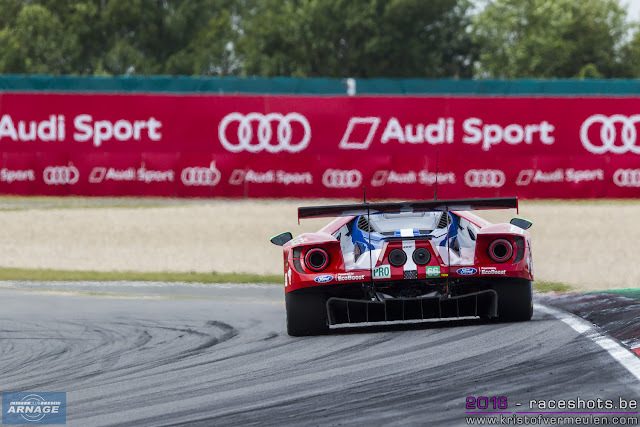 The fire damaged #67 Ford GT went back into pit box at 15:00 for another lengthy (11 minute) stop. 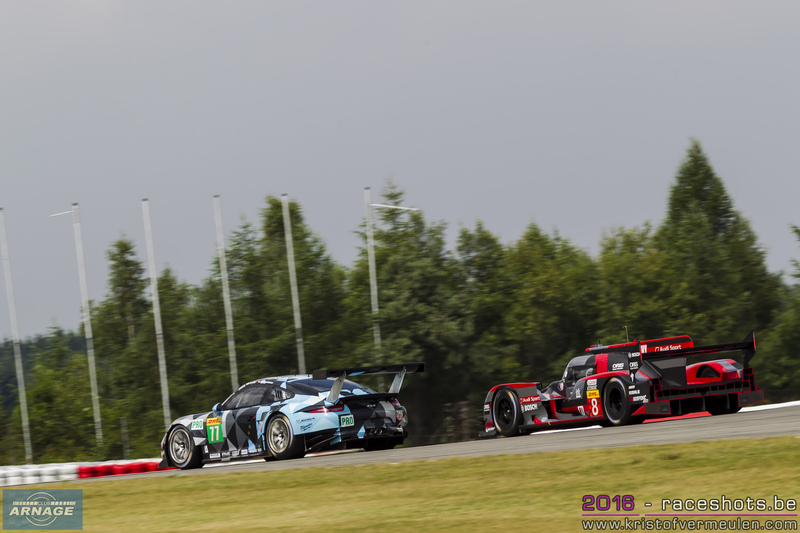 There was a flurry of GTE pit stops under the 10 minute FCY as 11 cars came in on the same lap, during which there was a pit fire for #88 Porsche that was quickly put out and the car was back on track immediately. 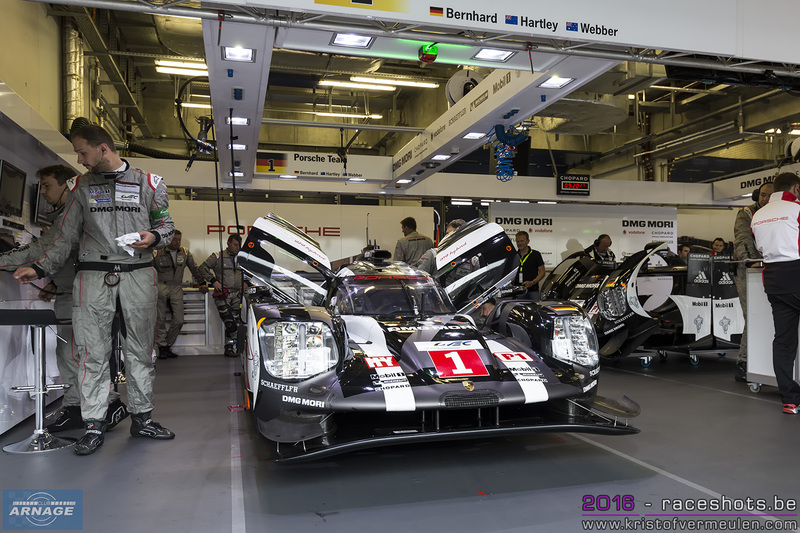 After the FCY was lifted, Webber in Porsche #1 led Audis #7 and #8 with Porsche #2 in 4th ahead of the two Toyotas. 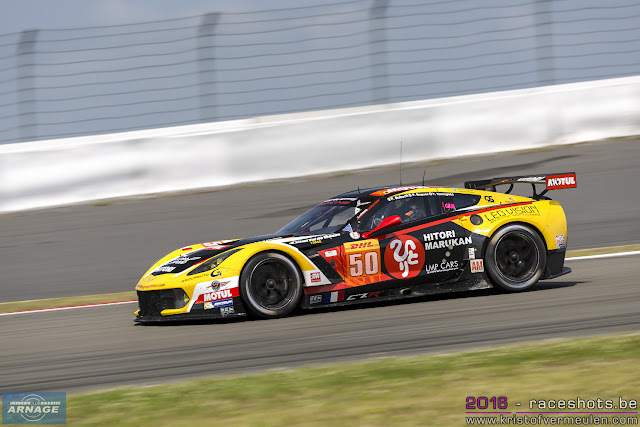 Yamagishi took over the Corvette #50 but couldn't maintain the pace set by Ragues and slipped out of the class lead to third. 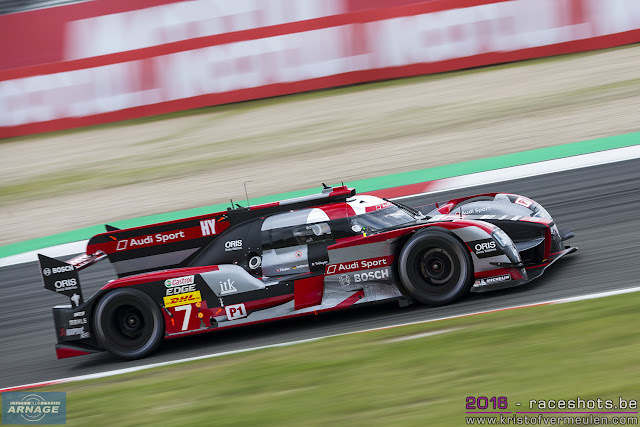 The 2nd and 3rd placed Audis switched over at 15:26 as DiGrassi in #8 passed Lotterer in the #7. 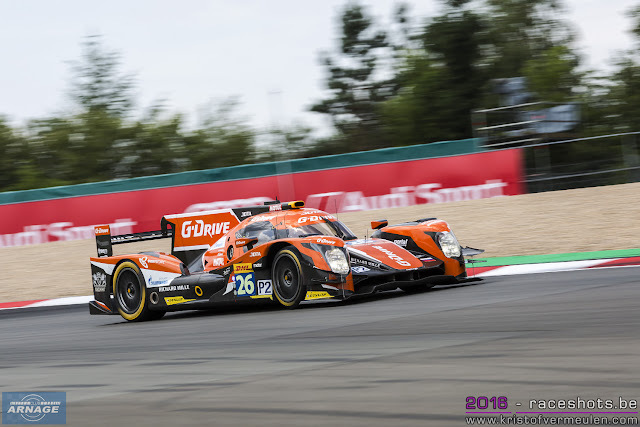 At 15:30 the long time LMP2 leading #26 G-Drive had a terminal gearbox problem, allowing the #36 Signatech Alpine to take over the class lead. 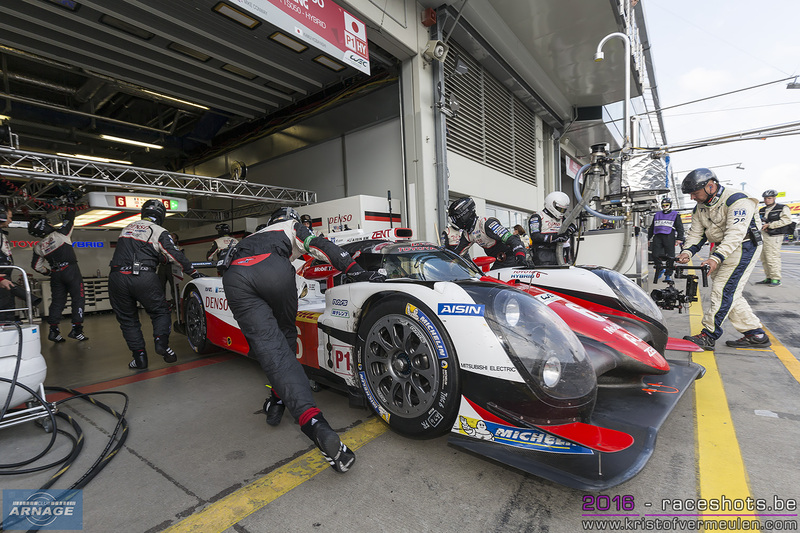 There was a worrying early stop for Davidson in Toyota #5 at 15:40. 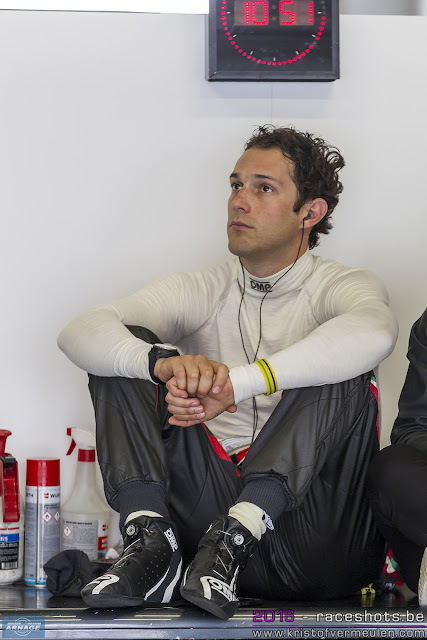 He shook his head and didn't look happy. There was a second full course yellow at 15:44 for debris clean-up at turn 6 that turned out to have fallen off the #5 Toyota. Jani stopped under yellow in Porsche #2 and maintained the lead. 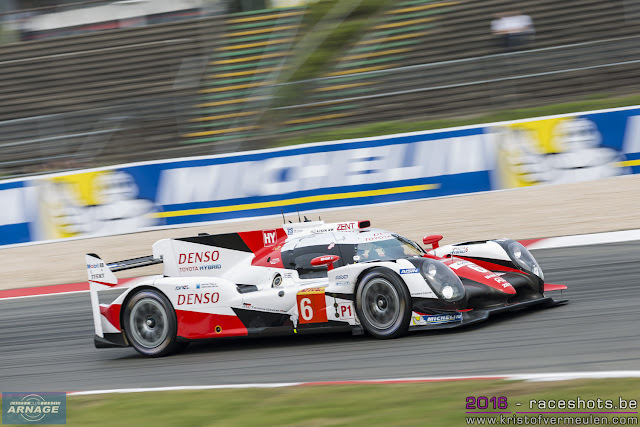 Toyota #6 also pitted under yellow, Sarrazin handed over to Conway and rejoined in 5th. 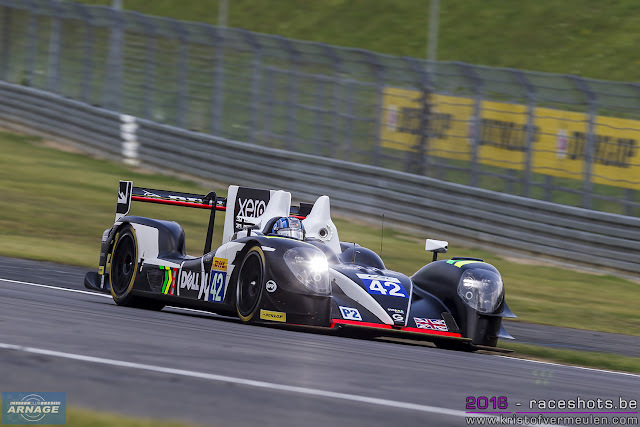 The #42 Strakka was also lucky with FCY and took lead of LMP2. At 16:15 there was a third FCY due to Webb in the #4 ByKolles CLM stranded at turn 4 with fire and smoke evident. The top 7 cars overall pitted under FCY. 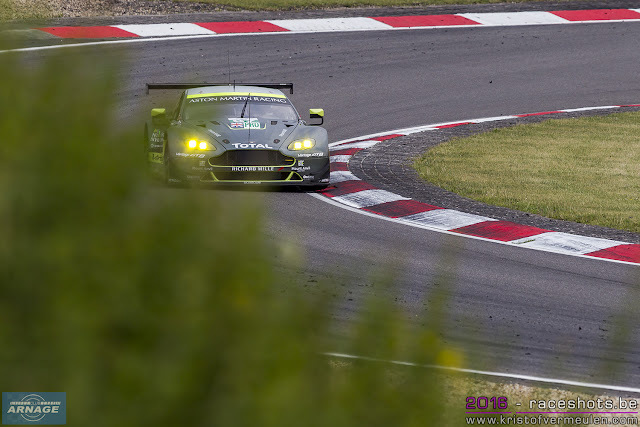 After stops, Lieb in Porsche #2 led, from Hartley in #1, DiGrassi in #8 Audi and Fassler in #7. 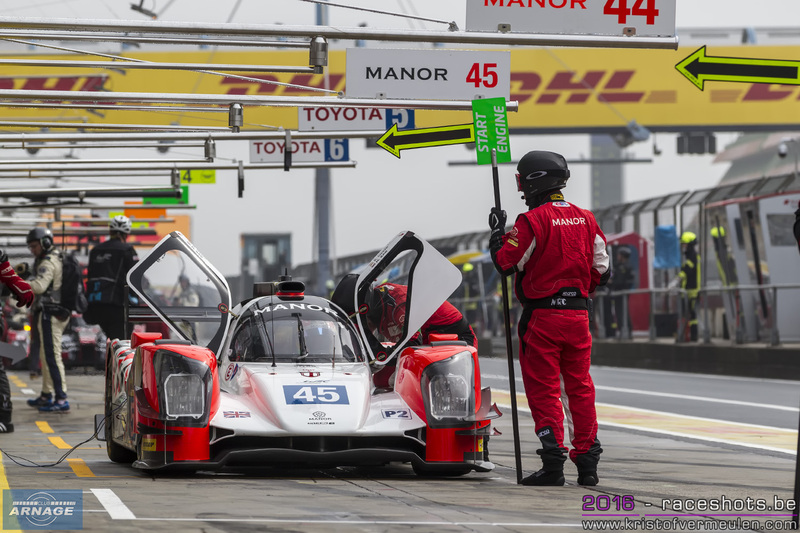 FCY was lifted at 16:24 but local yellow remained at T4 for another 10 minutes or so due to fluids left behind by the #4 car. Meanwhile, Bruni in the #51 Ferrari took the lead in GTE Pro. 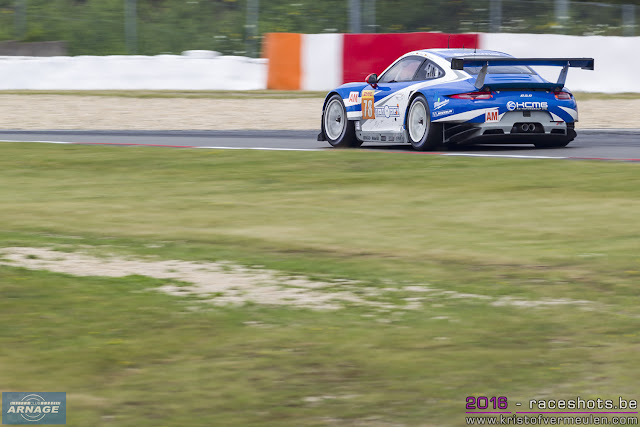 At 17:13 Al Quabasi in the #88 Porsche went off at T6 into gravel after contact with the #2 Porsche LMP1 driven by Lieb who managed to stay on track. 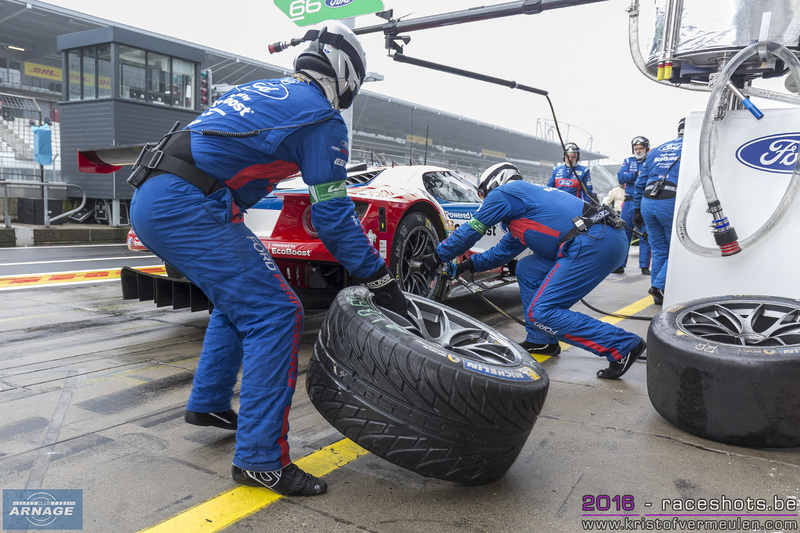 The damaged front bodywork of the #2 was replaced during a pit stop under the full course yellow (4th FCY of the day) that was raised to recover #88. Porsche #1 took over the lead as the #2 had a slightly extended stop. 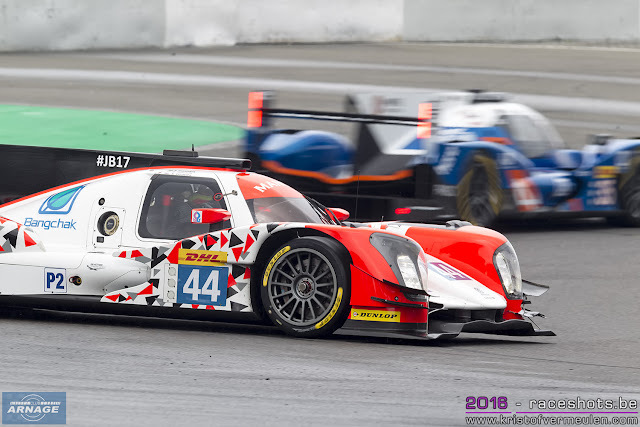 The FCY was lifted at 17:26. 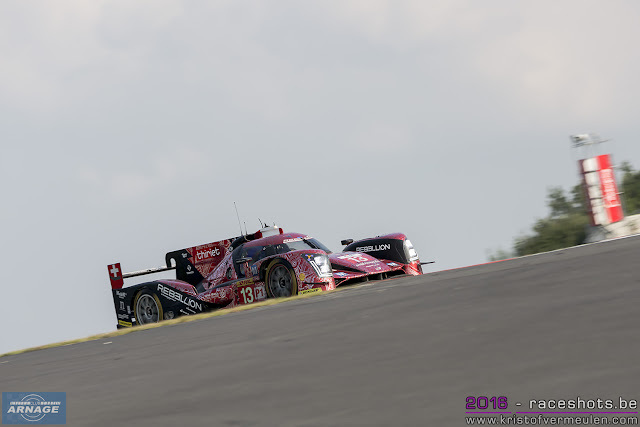 An 11 minute pit stop for Rebellion #13 relegated it to 11th overall There were also problems for the #12 a little later that required new front bodywork. 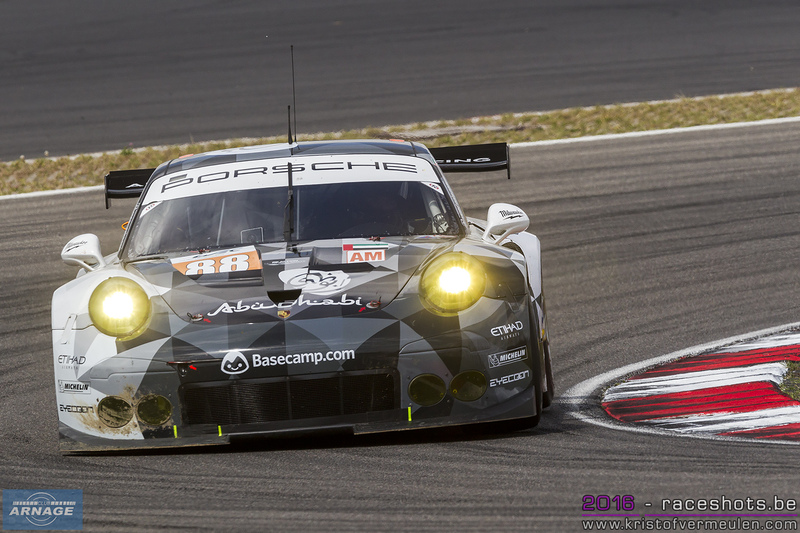 At 17:35 the #2 Porsche was given a drive through penalty for the collision with #88. After taking the penalty, Jani in #2 dropped to 3rd place, promoting Duval in the #8 Audi into 2nd. 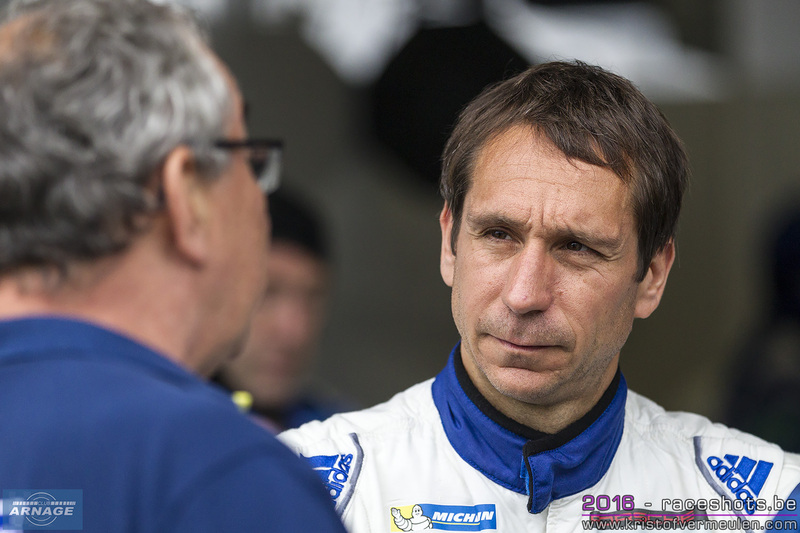 Jani quickly caught up with Duval, challenging hard for 2nd as the time ticked down to 1 hour remaining. Lotterer meanwhile in the #7 Audi had caught up behind the Duval-Jani battle and was soon on the heels of Jani while Duval sped off. 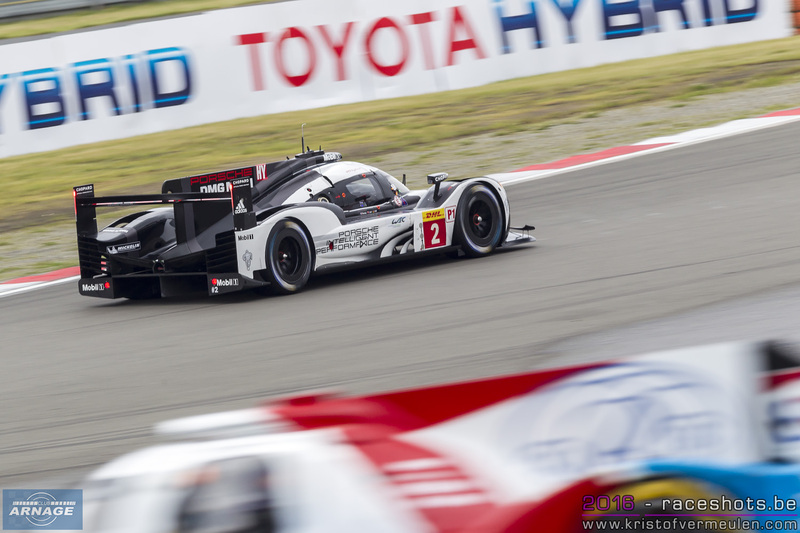 After a great dice, Lotterer finally made the pass stick and put the Audi in 3rd. 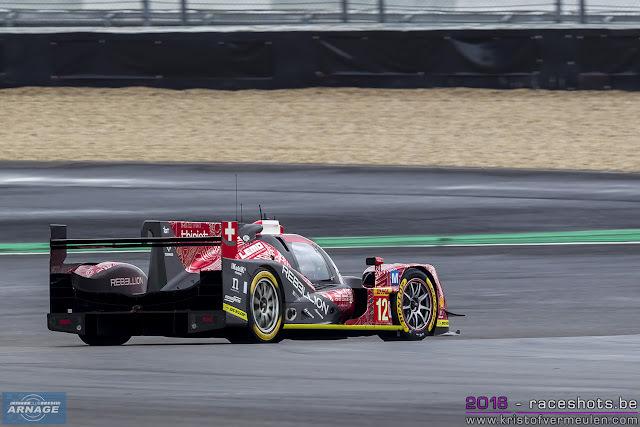 There was then a 5th FCY period to recover debris at the chicane, presumably left over from the Duval-Jani-Lotterer battle. 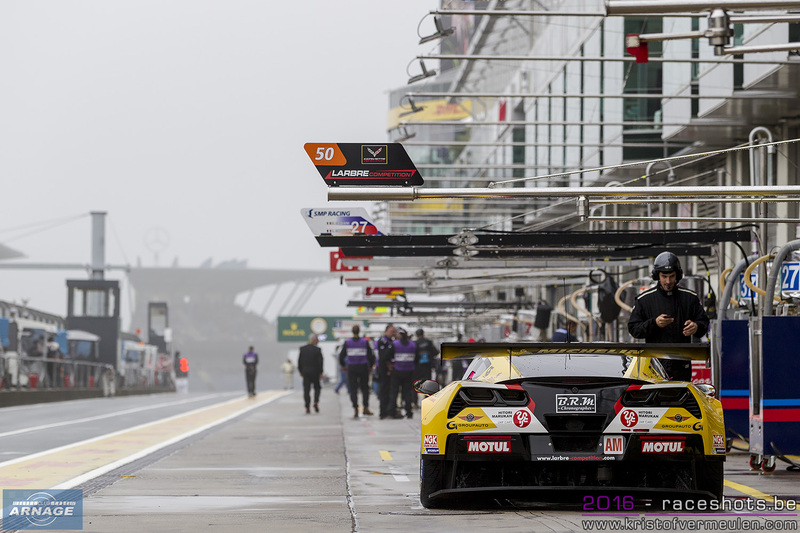 All the leading cars stopped under the caution period and fuelled to the finish with only 45 minutes remaining. 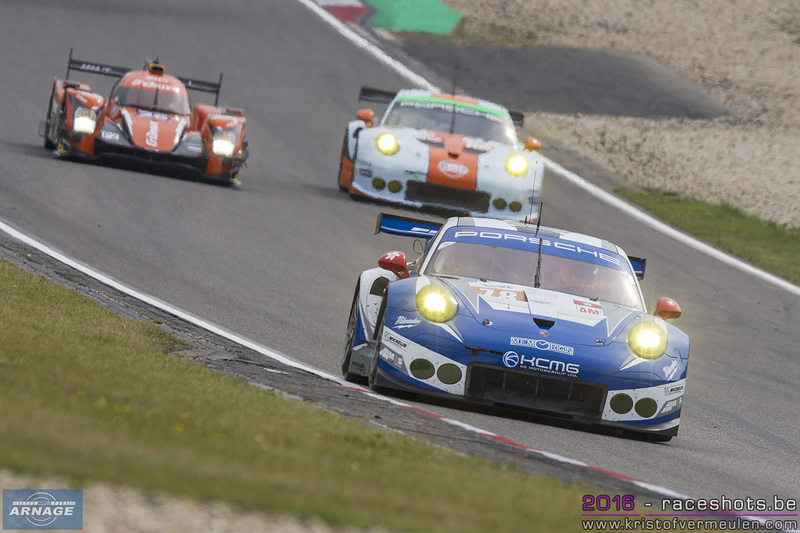 The #2 Porsche was subsequently shown a black and orange (bodywork) flag and was forced to stop and replace rear bodywork but remained in 4th place ahead of the #5 Toyota. 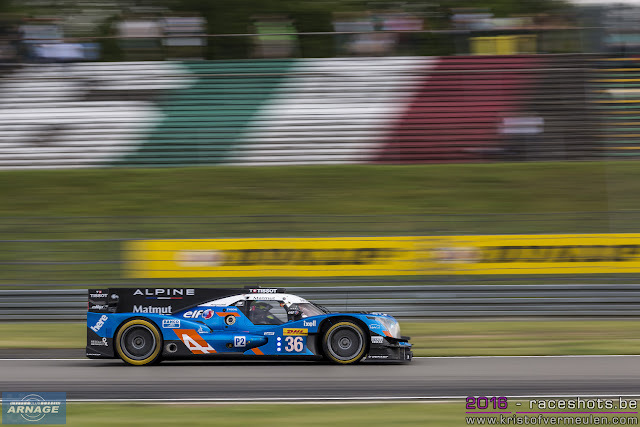 Into the final hour the lead of LMP2 looked solid for the #36 Signatech Alpine with the #43 RGR Ligier 30 seconds behind and the 31 ESR Ligier a lap adrift. 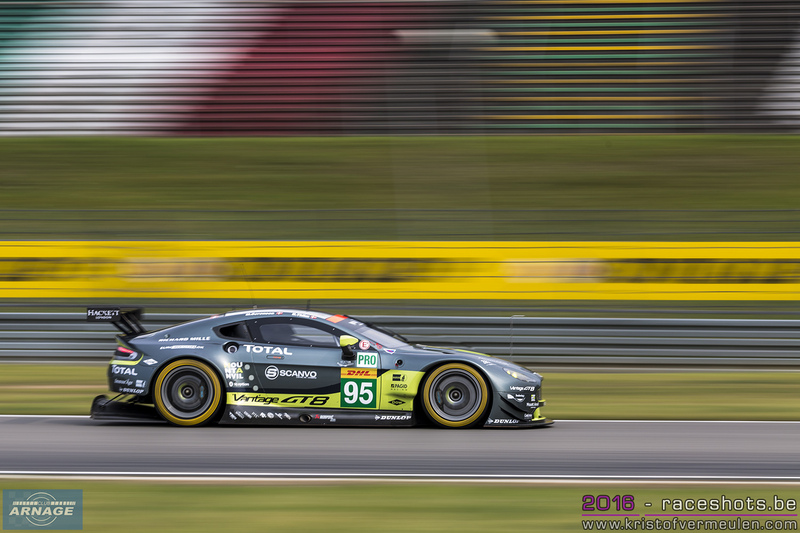 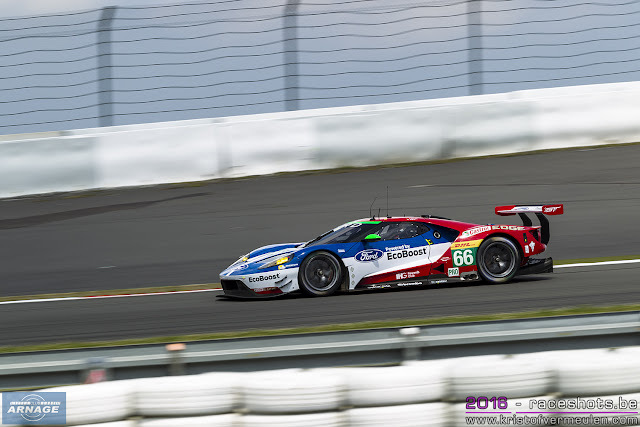 In GTE Pro there was more misfortune for the Ford Chip Ganassi Team when the #66 Ford GT was given a drive through penalty for a pit stop irregularity (seat belts unfastened before the car came to a complete stop) and dropped from 3rd to 4th behind the #95 Aston Martin. With only 12 minutes remaining, Bruno Senna had a trip through gravel in #43 RGR Ligier but maintained 2nd place in class despite the excursion. Porsche #1 of Bernhard, Webber and Hartley took the chequered flag first and there was a 'formation' finish for Audi in 2nd and 3rd. In LMP2 #36 Signatech Alpine won from #43 RGR Ligier 2nd and #31 ESM Ligier 3rd. 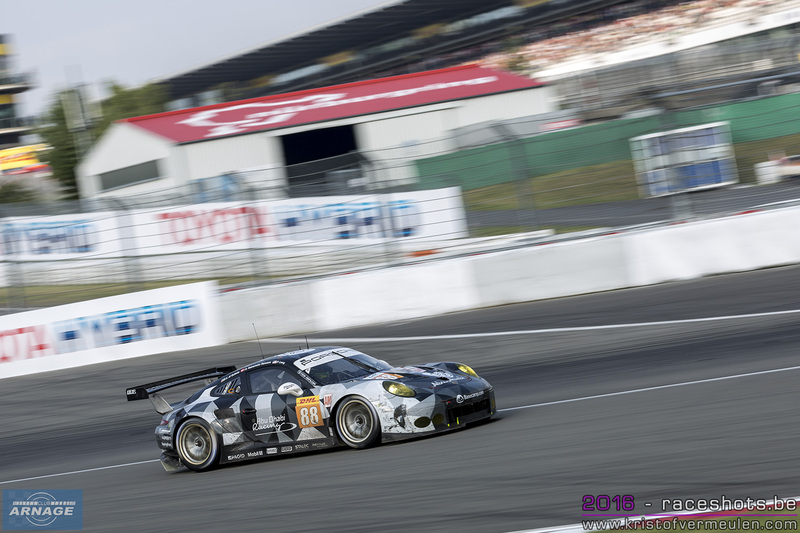 In GTE Pro it was the #51 AF Corse Ferrari that score the win ahead of #71 Ferrari and #95 Aston Martin. 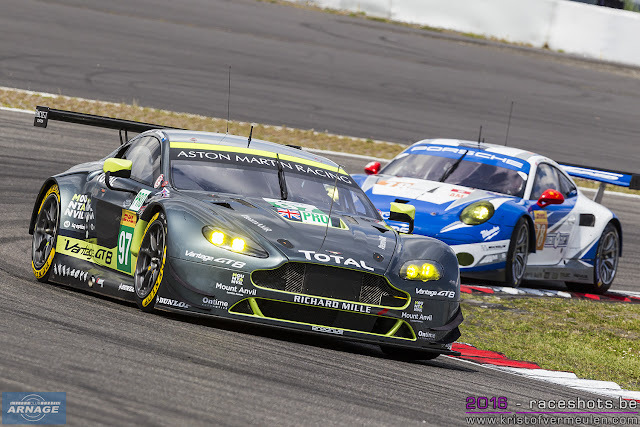 In GTE Am #98 Aston first from #78 KCMG Porsche and #83 AF Corse Ferrari. 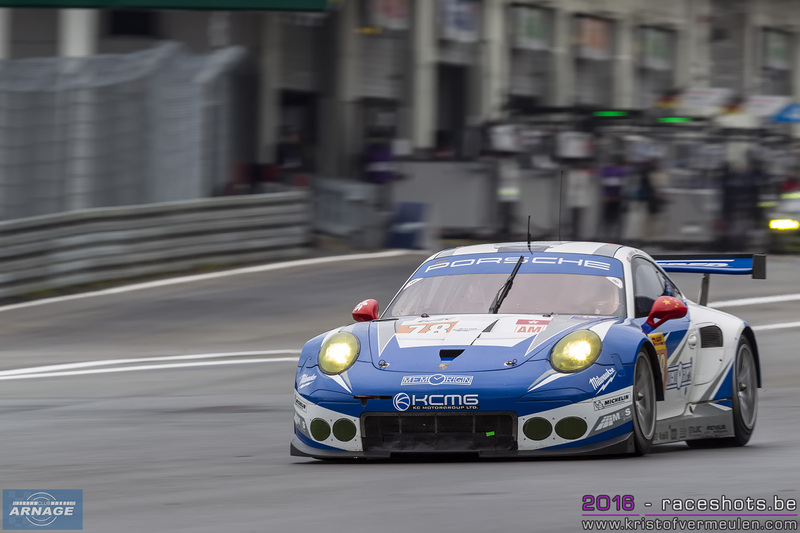 The #78 KCMG Porsche 911 RSR was later excluded from 6 Hours of Nürburgring results for failing to pass the post-race ride-height check. 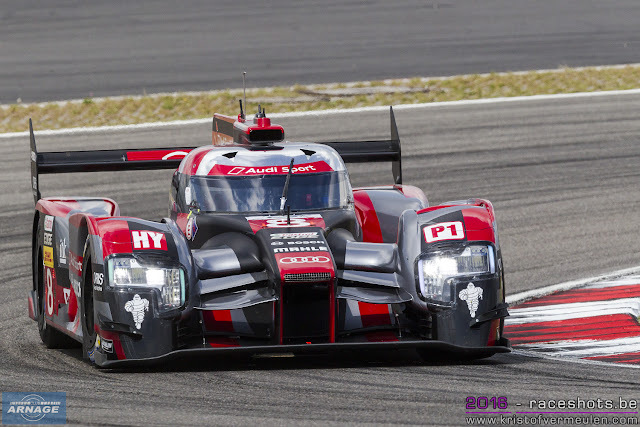 The fastest Lap was by Marcel Fassler in Audi #7 who set a time of 1:40.325 on lap 5. After the race, the #78 KCMG Porsche has been excluded from the race, due to a ride height which did not conform to the rules. 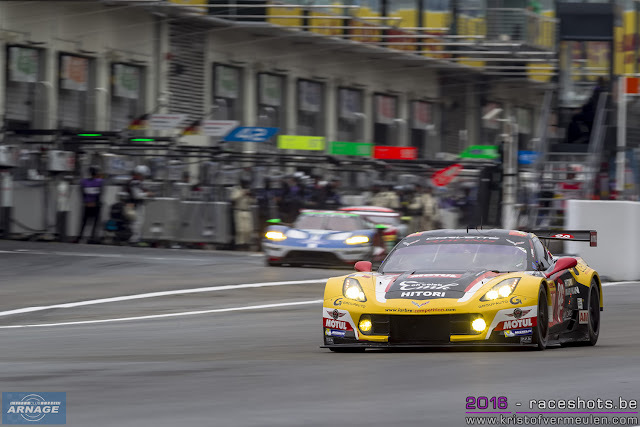 In GTE-Am, the #83 AF Corse Ferrari now has second place, ahead of the #50 Larbre Corvette. 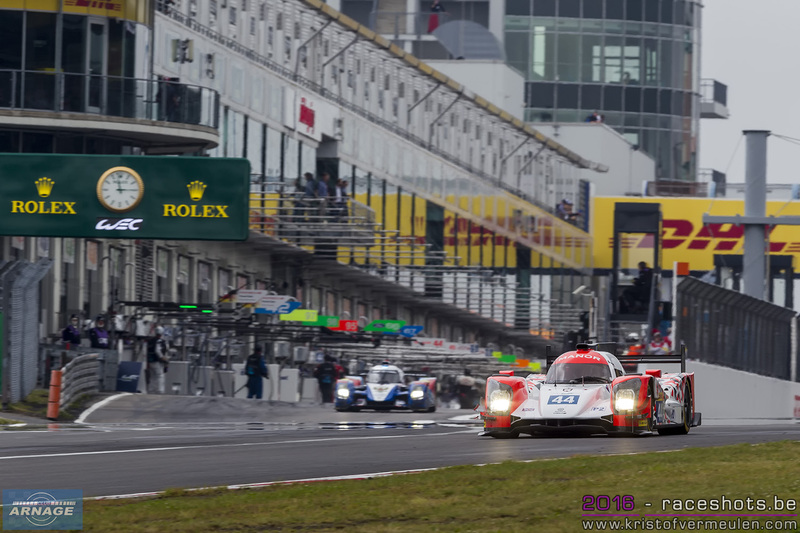 58,000 attended the race, which is confirmed as part of the 2017 WEC calendar. The next 6 hours of the Nürburgring will be on the 16th of July 2017. 6 Hours of the Nürburgring - Saturday practice and qualifying session.